Dual screens, durable, waterproof, shockproof. 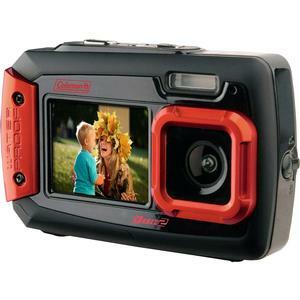 The Coleman Duo 2V9WP Waterproof & Shockproof Digital Camera combines 20.0 megapixels with 4x digital zoom, a 120° wide-angle lens, and a bright, high-quality 2.7-inch LCD screen coupled with a 1.8-inch front LCD display. 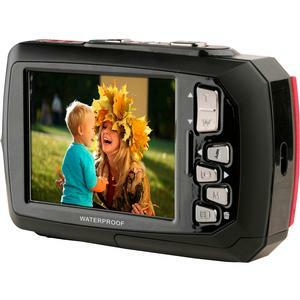 The 2V9WP also offers waterproof protection up to 10 feet (3 meters), plus shock and freeze resistance, making it the perfect companion for camping, beaches, skiing, winter sports, fishing, swimming pools, waterparks, and all other outdoor activities. Have peace of mind knowing you'll have waterproof protection up to 10 feet (3 meters). A system of waterproof seals and gaskets helps keep water, dust, sand and dirt out so you can take pictures and video in almost any environment. Rugged body and innovative shock-absorbing construction are designed to withstand a drop, bump, or other mishap from up to 3.2 feet (1 meter). You can rely on your Duo to perform even in extremely cold temperatures up to 14°F (10°C). The generous 2.7-inch LCD display features sharp, natural color that makes it easy to compose shots, read menus, and view photos and videos. The front 1.8-inch LCD display is perfect for taking self portraits or just including yourself in the photo with friends! Produce images with an impressive 20.0 megapixel resolution to deliver pictures with true-to-life color and pleasing details. What's more, with this high resolution, images can be significantly enlarged and still look great. You never have to squish together again with the Duo's wide-angle lens. Capture the whole picture without having to sacrifice the overall beauty of the shot because the subject doesn't fit within the frame. You will always be able to get the shot you need, no matter how close or far away, and always with the quality you expect. Variety of built-in scene modes such as Auto, Landscape, Night, Portrait, Sports, Backlight, and more to help get you the best shot. You'll be able to store hundreds of high-quality photos and videos with micro SDHC memory up to 32GB. Ideal for camping, beaches, skiing, winter sports, swimming pools, waterparks and other outdoor activities.